The promising Comet ISON, now less than two months away from a close encounter with the sun, is making a close approach to another member of the solar system today (Oct. 1): the planet Mars. 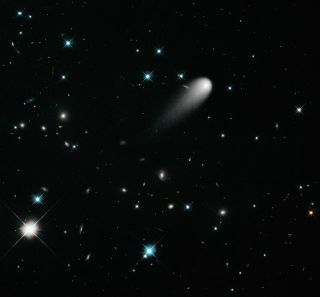 In the night sky, Comet ISON is currently located about 2 degrees above and to the left of Mars. Both Mars and ISON are in the constellation of Leo, not far to the west (right) of the famous backward-question mark configuration of stars popularly known as the Sickle. Many astronomy guide books will tell you that in order to see a 12th magnitude star you will need a telescope with an aperture of 4 to 6-inches. That is correct if you are searching for a star, but a comet is a totally different story. I would suggest a telescope in the 8 to 12-inch range and utilize a magnification of at least 200 to 300 power. In addition, if you're trying to see the comet you’ll have much better success by looking off to one side of its position (averted vision) rather than staring right at it; in that way you’ll be able to better detect its faint and fuzzy image. And you'll have to wait until around 4 a.m. local daylight time for both Mars and the comet to get at least 10 degrees above the east-northeast horizon — the equivalent of your clenched fist held at arm's length. While it may be challenging to see Comet ISON from Earth right now, an astronaut looking up from the surface of Mars would probably see ISON without any optical aid. Comet ISON is currently 199 million miles (319 million kilometers) from Earth, but it is only 6.7 million miles (10.8 million km) from the Red Planet. This means the comet is about 30.5 times closer to Mars than to Earth. Applying the inverse square law, the comet as seen from the Martian surface will appear to shine as bright as a fourth magnitude star. That's equivalent to a moderately faint star, but still bright enough to see with the naked eye against a dark sky. And Comet ISON's tail would appear perhaps as long as three degrees — the length of the three bright stars that form Orion’s famous belt. Although Comet ISON is closest to Mars today, our view from Earth will make it appear as if the comet and Mars are drawing even closer in the coming days and weeks. In fact, if you plan to seriously look the comet, here is a date to mark on your calendar: Tuesday, Oct. 15. On that morning, the comet will appear 1.1 degrees above and to the left of Mars, while Mars itself is passing only 0.9 degrees above and to the left of the bluish 1st-magnitude star Regulus, at the bottom of the Sickle of Leo. At around 5:30 a.m. local daylight time — just as dawn is about to break — Mars and Regulus will make for an eye-catching sight, about one-third of the way up in the eastern sky; a moderately bright yellow-orange "star" (Mars) hovering just above and to the left of a somewhat brighter and bluer star (Regulus). And just above and to the left of that colorful pair, perhaps by then glowing at 10th magnitude or maybe a little brighter will be the comet. Unfortunately, Comet ISON continues to run roughly two magnitudes fainter than original projections, although as astronomer Bruce Gary, who was the first to recover the comet after it moved out of the glare of the sun in mid-August, has recently noted: "By now ISON has probably passed the 'frost line,' so why is it unresponsive to the increasing level of solar illumination (and surface temperature)? There may be a wonderfully simple explanation for this, and it predicts a late 'coming alive' for this particular comet. The recent 'discovery' of a jet feature may be the key in understanding Comet ISON's behavior during the past 7 weeks." To echo Gary's comments, observers in recent days have begun to notice a lengthening of Comet ISON's tail, with faint streamers and jets also beginning to appear. This "might" be a sign that the sun's warmth has indeed begun to make the comet more active by way of sublimation; turning the frozen ice locked within its three-mile wide nucleus directly into vapor and increasing the overall size and brightness of its diffuse head or coma. If the comet is indeed finally "coming alive" the next several weeks will be exciting ones as Comet ISON makes its plunge toward the sun. Stay tuned to SPACE.com for future updates!